“Stop! Little girl! Little girl! Stop!” Marty shouts as he runs across the street to a girl with a scooter. “Look… I need to borrow your…hoverboard?” Marty picks up the scooter and notices the label and the lack of wheels. In Hill Valley, Marty’s hoverboard is a pink and orange model with handlebars made by Mattel. Other models are seen used by Griff’s gang which were made by other companies. Griff’s Pit Bill has rockets on the side. 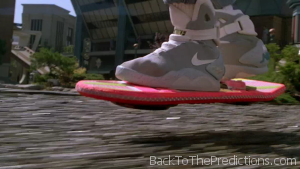 The technology of the hoverboard was not explained in the movie, but it’s generally accepted that the discs on the bottom were anti-gravity devices. Prop sources refer to the center box on the bottom as a “polarity reversing acceleration booster”. Marty discovered it didn’t work on water because he had no way to propel himself forward. Mattel released a full-scale prop replica in 2012 that was similar to the movie prop. It didn’t actually hover, of course, but had sound effects and would glide on carpet. Unfortunately, it wasn’t as accurate as fan (including Bob Gale) had hoped. HalloweenCostumes.com produced their own licensed replica named “Back to the Future Hoverboard” in February 2014. It was essentially the same as the Mattel version, but did not have Mattel logos, sound effects, a handlebar hole, or the “polarity reversing acceleration booster” (which Mattel used as a battery box). As far as working hoverboards are concerned, a company named Hendo announced on October 21, 2014 that they had been working on a hoverboard that hovered an inch off the ground. The Hendo Hover uses magnetic fields on specially-lined copper floors. They launched a Kickstarter campaign to finish production and create places to ride them. At the end of the campaign on December 15, 2014, the Kickstarter campaign had reached $510,590, well over their $250,000 goal. On June 24, 2015, Lexus revealed they had a prototype hoverboard powered by liquid nitrogen cooled semiconductors. Like the Hendo hoverboard, it can only be used in special skateparks that have permanent magnets in the ground. …and then there’s Catalin Alexandru Duru from Montreal who founded Omni Hoverboards and holds the world record for the longest hoverboard flight. His “hoverboard” is a multirotor platform that he can stand on. It’s large and has motors and propellers, not an anti-gravity or magnetic levitation device. The hoverboarding scenes in Back to the Future Part II and Part III were done using wires with the hoverboard strapped to the actors’ feet. Other shots which didn’t suspend the actors on wires would hide the wheels or pole supporting the hoverboard. Although attempts have been made (and some merely for publicity’s sake), nobody has yet been able to produce a hoverboard that would work on any surface. We’re waiting!